The C80 ceiling system gives maximum freedom with reference to form, colour combination and integrated / concealed lighting fittings. The ceiling is based upon the popular spline/panel design – but in a new form in which panels are of differing widths, panel direction can easily be changed, and not least, there is a choice of colours for both panel and spline. All components in C80 ceilings are self-supporting up to 3 meters and are removable. – a broad »female« panel with kerf edge profiles, and a narrower »male-panel« (shadow spline). The two panel types are mounted alternately and either panel can be removed, rotated laterally, and be re-installed in the same position: a simple and logical construction. As fire protection, all panels are supplied backed with mineral wool, and only where there are lighting fittings is it necessary to install additional insulation. Special panels are provided for use with panel direction changes and these cannot be used elsewhere. 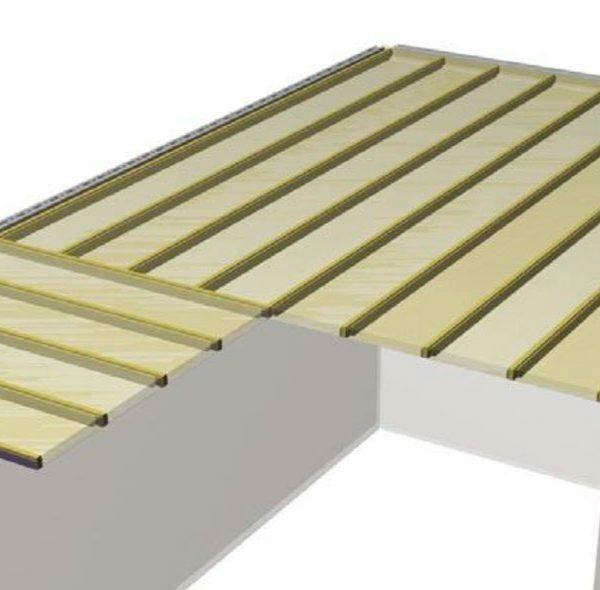 Panels are available as standard widths of 270 mm and splines 30 mm. Together these form standard 300mm units, but other panel sizes can be provided. The overall in-built height of the C80 ceiling is 60 mm and it requires less than 50 mm space above the panels for installation/removal. With electrical fitting there must be room for 50 mm fire insulation.